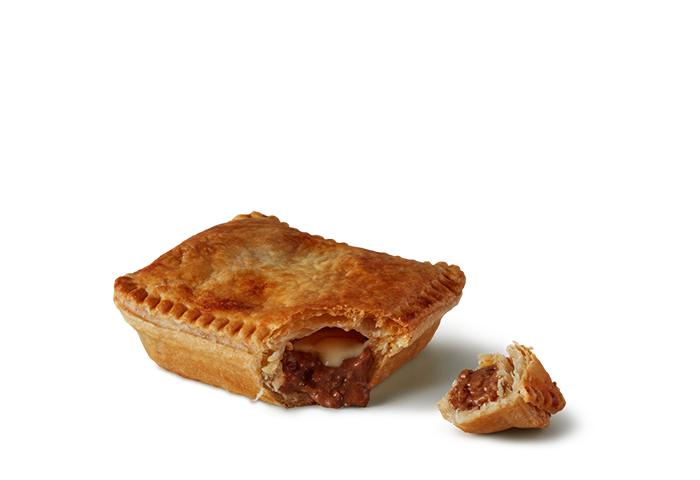 Made to the original recipe using quality New Zealand beef, the classic Steak Mince 'N' Cheese pies are baked fresh in store each day for you to enjoy. Water, Wheat Flour, Beef (18%), Margarine [Animal & Vegetable Fats and Oils, Water, Salt, Emulsifiers (Soy Lecithin, 471), Acidity Regulators (330, 500), Antioxidants (307b, 320), Colour (160a)], Cheese (10%) [Milk, Salt, Thickener (1422), Stabilisers (415, 466), Emulsifiers (331, 451), Rennet, Culture, Acidity Regulator (330)], Thickener (1422), Milk Solids, Seasoning (Flavour Enhancers (627, 631)), Salt, Tomato Puree, Dehydrated Onion, Colours (102, 124, 150c), Emulsifier (472e). Product manufactured on a line that produces products containing egg.